Within the word Tarot is the Latin word ROTA, meaning "wheel." 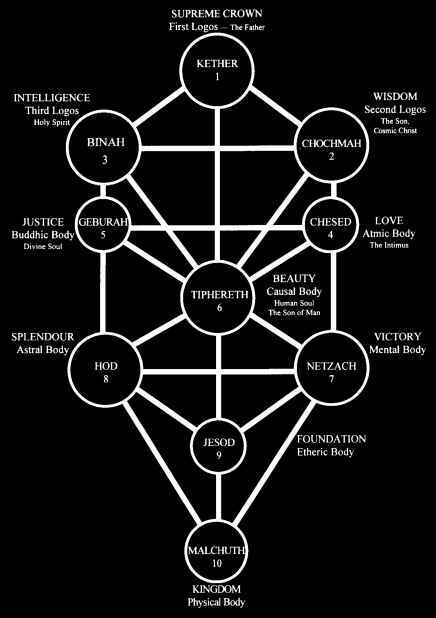 If we imagine a circular frame connected by four spokes to a central hub, with one letter oí the Tetragrammaton in each quadrant, we have the Wheel of Eternal Truth, endlessly turning to create power and motion in the universe. These spokes come from the central axis of the AIN SOPH — the nucleus of God. The four letters of the word TAROT (the final T is identical to the first T, also symbolizing the Worm Ouroboros, whose tail is in his mouth, the end in the beginning) can also be seen in this wheel, and their relationship to the four letters of the Tetragrammaton — YOD HE VAU HE — can be appreciated on a spiritual, if not wholly on a conscious level, by meditation on this wheel. 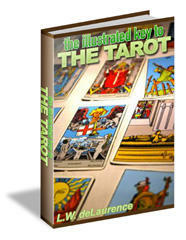 It can be seen on the Major Arcana card, WHEEL OF FORTUNE, and has also been reproduced on the cover of this Handbook. Another reference to keep in mind about the wheel symbol is its link to the eternal cycle of reincarnation and its implication for the soul's growth. from one through the repetition of the series to second HE into the Divine another. Triad: YHV(H). The esoteric science of numbers is closely interwoven with the Tarot and the Tetragrammaton. I will attempt to go only a little way into this complex subject here, just enough to give you a feeling of how the Sacred Name is numerically involved with the cards. The second HE becomes the FIRST term of the second series or level of YOD HE VAU HE, and so on. Numerically, the first three characters represent the three points of the trinity, or Divine Triad — the very representation of God himself — Father, Son and Holy Spirit. Y H V H merges with YHV Hmerges with Y H V H merges into the First term and now becomes the 1 of another series (10 = 1 +0 = 1). As for the Major Arcana, we will study their relationship to the Tetragrammaton in Chapter 6. Although there is much more to be learned concerning the relationship between the Tetragrammaton and the Tarot, the above should be enough to give you a feeling of the subject, and to enable you to work with the Minor Mentors in a little more depth.